Рис. 280. Положение сердца в перикарде (околосердечной сумке). Перикард ( pericardium) и плевральные полости вскрыты. Передние края правого и левого легких оттянуты в стороны. Вид спереди. Fig. 280. 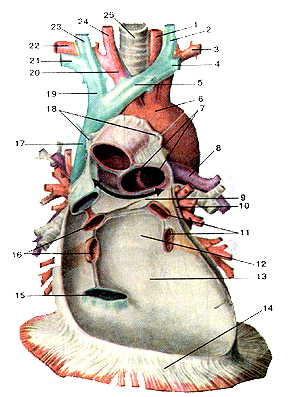 Position of heart in the pericardium (pericardial cavity). 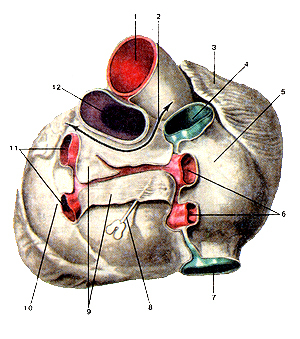 Pericardium and pleural cavities are opened. 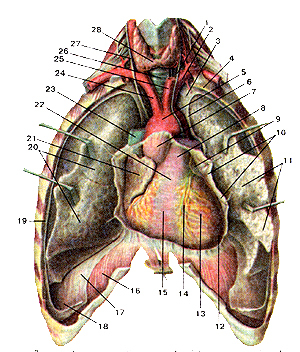 Anterior border of right and left lungs are unfolded. 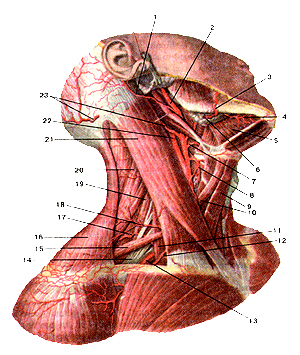 Anterior aspect. Anterior wall of pericardium and heart are removed. Frontal view. I-left common carotid artery; 2-left internal jugular vein; 3-left subclavian adery; 4-lefl subclavian vein; 5-left brachiocephalic vein; 6-arch of aorta; 7-pulmonary trunk (the place of it's division into right and left pulmonary arteries); 8-lefl pulmonary artery; 9-arrow shows position of transverse sinus of pericardium; 10-pericardium (cut-off zone); 11-left pulmonary veins; 12-oblique sinus of pericardium; 13-posterior wall of pericardium; 14-diaphragm; 15-inferior vena cava; 16-right pulmonary veins; 17-supe-riorvena cava; 18-the place of transition of pericardium on aorta and other major blood vessels; 19-right brachiocephalic vein; 20 -right brachio-cephalic trunk; 21-right subclavian vein; 22-right subclavian artery; 23-right internal jugular vein; 24-right common carotid artery; 25-trachea. Рис. 283. Проекция границ сердца, его клапанов и крупных сосудов на переднюю грудную стенку. Fig. 283. Проекция границ сердца, его клапанов и крупных сосудов на переднюю грудную стенку. Fig. 283. 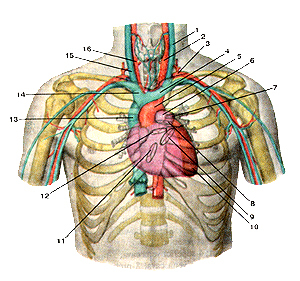 Projection of heart borders, its valves and major blood vessels on the anterior chest wall. Рис. 284. Артерии шеи. Кожа и подкожная мышца шеи удалены. Вид справа.